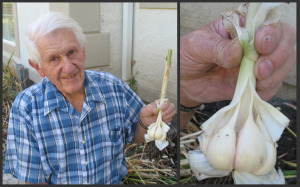 I have been gardening for over 70 years, and I learned the key to growing garlic successfully. I could never understand why garlic died down in July while my onions were thriving. Both had been planted at the same time. There are different types of garlic: the kind you buy in the store has multiple cloves. The cloves get smaller as you get to the center of the bulb. According to “the boys who know”, this is junk compared to the type they’ve taught me to grow. There are many excellent varieties available that vary in flavor and intensity of garlic heat. 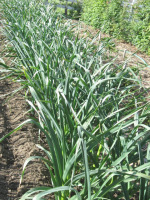 This good kind of garlic has a single row of cloves varying from 4 to 7 cloves per bulb. There’s not a bunch of little cloves in the center of the bulb. To order garlic click here. The life cycle of garlic is somewhat different than most garden plants. Growing garlic is like growing a tulip or daffodil. Plant it before winter begins. A cold winter freeze is not needed for growing garlic. Many varieties grow around the world in warm climates. All varieties should acclimate to their new temperature, water, and soil conditions after a few years. 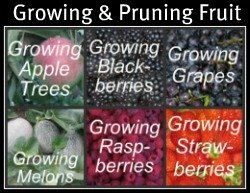 Some varieties will probably achieve their maximum genetic potential in specific climates. Plant your garlic about a month before the first frost. This allows the root system of the plant to develop before winter sets in. Early in the spring while the snow is melting, the developing garlic cloves continue to grow. It grows vigorously during these cool months developing a healthy leaf system. 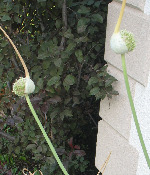 In May or early June it sends up a long stalk that has a round seed bulb called a scape. In July the plant matures and the leaves start to die. When the seed bulb (scape) starts to open up and show the small individual fruiting seeds, it is time to harvest your garlic. In early October, you should till some organic matter into your soil to encourage vigorous plant growth. Then dig a small trench about 6-8 inches wide. Sprinkle some Ammonium Sulfate in the bottom of the trench and mix this into the soil. Place the individual cloves in the trench about 3 inches apart. The rows are 5-6 inches away from each other. When growing garlic, I like to plant this double row so I can water the garlic with a drip line that goes down the middle of these two rows. Cover the top of the cloves with 2 inches of soil. 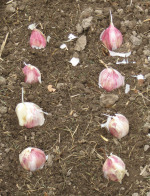 If you have different varieties of garlic, mark the end of each row so you can separate them at harvest time. Keep the garlic watered so that the soil stays moist during the growing season. Harvesting garlic is the best part of growing garlic. 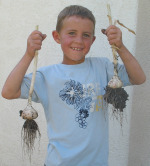 This is when you get to see the big garlic bulbs that have been growing underground. The garlic plants will send up a long scape that droops over like a candy cane. Right before it's time to harvest the garlic, this scape will straighten up. When the seed pod at the end of the scape opens, it's time to harvest the garlic bulbs. This will happen some time in July or August. Note: In order to maximize the growth of the bulb, it is recommended that you cut the long stems as they begin to develop. This way the plant can send its energy to the root bulb rather than the seed bulb at the top of the plant. Leave a few stems/scapes so you’ll know when to harvest the garlic. Dig out the garlic rather than pulling it up so that you don’t break off the stems. Storing your garlic properly is important to maximize the shelf life of the garlic. Remove the majority of the soil and tie the stems together in clumps of about 20. Be sure to keep the different varieties identified and marked. Hang the bulbs out of the direct sunlight in a barn or shed and allow them the dry for 2-3 months. After they’ve dried, you can cut off the stem - about one inch above the bulb. Put your dried garlic in paper bags. Store in a cool, dry, dark area. Replant some of your garlic cloves. Each garlic clove will become a new garlic bulb. The rest of your garlic is ready to be used, shared, or sold. You'll enjoy the flavor of this exceptional garlic you've grown. Why should you grow garlic? Garlic is a powerful, anti-bacterial, anti-viral herb. 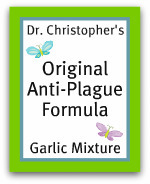 Garlic is one of the most effective natural antibiotics available to us. In an emergency situation, when normal medical help is not available, you’ll want to know how to grow and use garlic. When my wife and I were away from home working in California, we visited many homes that had sick people. We pressed a few cloves of garlic and put them in our tomato juice. Each night we would drink this juice with toast or crackers. We never got sick. Whenever I feel the flu or another type of sickness coming on, I take garlic. It doesn’t take long until I am back to normal. I discovered the true power of fresh garlic a little over 15 years ago. My oldest son had chronic ear infections starting from a very young age, and he was on prescription antibiotics almost constantly. Learn more about how fresh garlic can help an ear infection. Of course the major use of garlic for most of us is to flavor our food. If you use it appropriately, it makes food taste great. The two major benefits of growing garlic are great tasting food and a healthier body. Great Reasons to grow garlic!